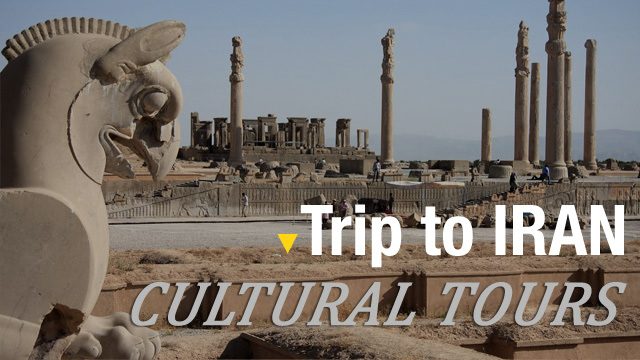 Many who travel to Iran are shocked by the actual image of Iranian everyday life which is contrary to their expectations created from the untrue reflection of the media. 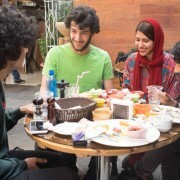 Iran’s youth –under 40s- that comprise more than 60 percent of the whole population, have their own lifestyle and leisure pursuits. They either spend quality time with their group of friends in their get-togethers chatting, watching the latest world-famous series, smoking cigarettes or hookah and even drinking and partying; or they hang out in some recreational areas of the town having fun. 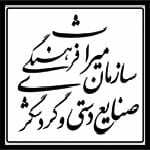 In this article we are going to name some of these areas where you can face and take in the real vibrant life of the Iranian young generation. Bame Tehran, located in the north of Tehran, is one of the great recreational places for the youth. You can see groups of young people taking a break from busy everyday life. You may see lots of people especially during the weekend going there for a walk or even climbing Tochal Mountain up to station 2 or 3 and probably coming down by Tochal Tele-cabin and enjoying the magnificent view over the city. Along the walking path there are plenty of restaurants, cafes and fast food places for people to take a break and chat and of course satisfy their stomach. There are also several other fun activities which may give them Adrenalin kick like bungee jumping, Tochal Zipline, Tochal Telesiege, Tochal Mountain Coaster or even Tochal ski resort which can be combined with an overnight stay at the luxurious Tochal Hotel to be literally over the clouds! Chitgar artificial lake located in the north-west of Tehran, and close to Chitgar Park, is a resort center where lots and lots of young Iranian and families gather to have some hours of fun and recreation. This 150-hectar lake and its coastal resort built not long ago and still being developed provides a peaceful place to chill out and have good moments. Some may choose to ride a pedal or paddle boat or sit at the pebbly beach and have some snacks and some conversations. Others may prefer to go to the amazement park or very commonly give the Bamland Mal a visit and shop from the well-known brands and finally grab a bite at the gourmet restaurants with a perfect view of the lake. Where fire and water meet! Ab-o-Atash Park (literally water and fire park) is another recreational target for many Iranian youth. The vast green area surrounded by busy expressways of Tehran was designed exclusively for water-playing, alongside four fire-towers which make fire flames as high as 6 to 8 meters accompanied by music. There is also an amphitheater in the park with a large tent that is usually used by young people to play badminton or other sports there. Other activities in the park include horse training, gazebos and plenty of modernly designed spaces and benches and of course a food court with many restaurants where people can relax and have their meals or some drinks in a soothing atmosphere. 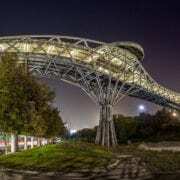 In the middle of the park there is the famous bridge called Tabiat bridge (Nature Bridge) which connects this park to Taleghani park (another magnificent neighboring park) by spanning Modarres Expressway. The bridge, which is known to be the largest pedestrian overpass provides an impressive sight of Tehran which gets even more beautiful after the sunset showing a nice frame of Tehran at nights. People may want to stay more on the bridge and pick at some food or drinks at the restaurants and cafes on Tabiat Bridge. Darakeh is an entry point into nearby mountains and a village on the slopes of the mountains to the north of Tehran and is one of the many spots that people can go for a soft or hard hike depending on how far they wish to walk. Because the village is near the fast-paced Tehran, many Tehranians retreat to Darakeh to relax, enjoy the many restaurants, and take hikes on the beautiful hiking terrain. 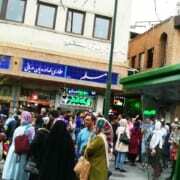 Having a dinner in a restaurant of Darakeh offers a chance to experience young Iranian life in the capital of Iran.